Aha! The full Cumberbatch photobomb! I believe we are all familiar with that awesome Benedict Cumberbatch photobomb of U2 at the Academy Awards. But at last the full thing has been shared on the internet. 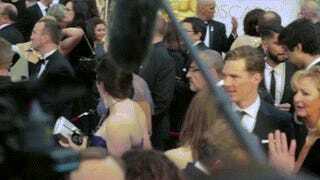 Note, the mighty Cumberbatch freezes upon seeing his prey. Sensing opportunity he thoughtfully decides on the best course of action. Quickly he makes his way through the crowded human jungle and immediately strikes! Yes, I know, my future as a National Geographic narrator is definitely not going to happen. But at least I tried. What I hear in my head while watching that GIF I am just incapable of transcribing without dumbing down and making sound stupid. I haven't had caffeine yet and we're out of my preferred sodas at work. STOP JUDGING ME!